Interview Mocha now launches ‘Mark for Review’ feature by popular demand from many of our existing and prospective customers. This allows the test taker to mark any question he would like to revisit. While attempting the test if the candidate is not sure about the answer then he or she can mark the particular question for 'Mark for Review' and can move further. During the session, he can any time revisit the marked question and change or verify the original answer. In the earlier version, this facility was not available and it closely resembled an interview scenario in which a job seeker has to answer a question as and when it was put to him by the interviewer. Answer a question and move sequentially to the next question. Example - move from Question 1 to Question 2. 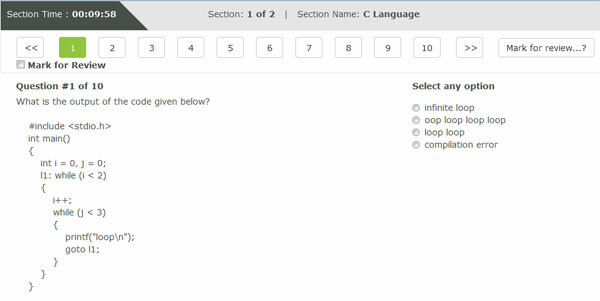 Jump to any question by clicking on the question number in the question bar. Example - attempt Que 8 and, then Question 3, then jump to Question 15. If question unanswered, cannot reattempt. If question unanswered can attempt later. If question answered but not sure if the answer is correct, cannot reattempt. If question answered but not sure, the candidate can reattempt or change the answer. Where bandwidth is low there were issues with the TEST experience as any question was loaded from the Interview Mocha server only after the previous one is answered. So, if there are 20 questions there is a signal transfer 20 times. If at any time the signal is broken the test comes to a halt. In locations where the bandwidth is low, the new version works better as all the questions are loaded together and there is no probability of the test coming to a halt. How will this benefit our customers? Pre-employment testing: Mark for Review creates a superior candidate experience, as the candidate can revisit questions where he wants to rectify answers. In pre-employment testing, a good candidate experience is a vital aspect. Online examinations for students: For any online examination held by an educational institute this feature is essential. Training assessments for employees: When any organization wishes to conduct assessments for its employees Mark for Review is a must. Certifications: When certifications are to be awarded to any student or employee of an organization by any certifying body the facility for reattempting questions during the test is necessary. 1) This is the format of the test page which displays the 'Mark for Review' feature with a checkbox and question bar right above the question. 2) Now to give a better understanding of 'Mark for Review' feature, we have provided a button where a candidate can find the meaning of a particular color code. The color code denotes the status of the question(s). 3) Once the candidate starts appearing for the test, the attempted question number will change to Blue color. The question skipped or not attempted will remain White in color. The question that is being attempted by the candidate will show Green color. 4) If the candidate is not sure about the answer and likes to review the answer before submitting the test, he or she can use the 'Mark for Review' option and can move on to next question. The question marked as mark for review will change to Red color. So if you have not yet tried your hands on this new feature, we suggest you to immediately log in and see it yourself. Don't forget to share your views or feedback regarding our new feature.